Are you a godparent, parent or godchild? Congratulations, you are invited! 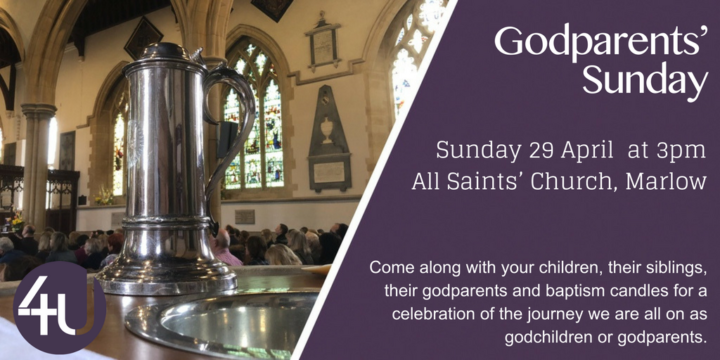 Being asked to be a godparent is one of life’s great privileges, so to celebrate this, the 4U Team are hosting a special afternoon service at 3pm on Sunday 29th April at All Saints’ Church, Marlow. Come along with your children, their siblings, their godparents and your baptism candles ready for a celebration of the journey we are all on as godchildren or godparents. The service itself will involve a short child-friendly 30 minutes service remembering our baptism promises. After this we’ll have the chance to chat to others and explore the activity stations and soft play around the church. Afternoon tea will also be available with plenty of child-friendly snacks too! For catering purposes it would be useful to know if you are planning to come so if you know you’ll be joining us then please let the parish office by emailing parish.office@4u-team.org or by phoning 01628 481806 before the 20th April. Of course if you haven’t told us you’re coming, please don’t let that stop you from joining us on the day, you’d still be more than welcome. We look forward to celebrating Godparents’ Sunday with you and your family!